Multicast is allowed and enabled on all networks/VLANs involving Airtame. The firewall doesn't have any configuration that would block multicast traffic. The Multicast ports 1900 + 1901 are open and communicating between VLANs. Symptom: No Airtame devices show up in the app when using Aruba equipment. Solution: Apply the steps to configure your Aruba network using this guide. Symptom: No Airtame devices show up in the app when computer & Airtames are connected to different VLANs, despite of Multicast being enabled. Solution: Make sure the option "Require IGMP Membership report" is disabled. Symptom: Airtame devices show up on all other computers except Windows PCs. Solution: Windows has the ability to run its own SSDP multicast group. When this service is running, all the received multicast traffic gets "swallowed" by the service. To solve this, go to "Services>SSDP Discovery>Properties>[startup type]=disabled or Manual". After this you will need to stop the service from running by right-clicking on the service "SSDP Discovery" and click "Stop"
☝️We have received feedback from users stating that this suggestion, combined with disabling Antivirus solved their discovery issues. We do not suggest disabling your Antivirus but working with it, so that it stops blocking SSDP traffic to the Airtame app. Symptom: Device is not showing up or is showing up but doesn't work. Solution: SSDP traffic is sent to the multicast address (239.255.255.250) which cannot be natted. 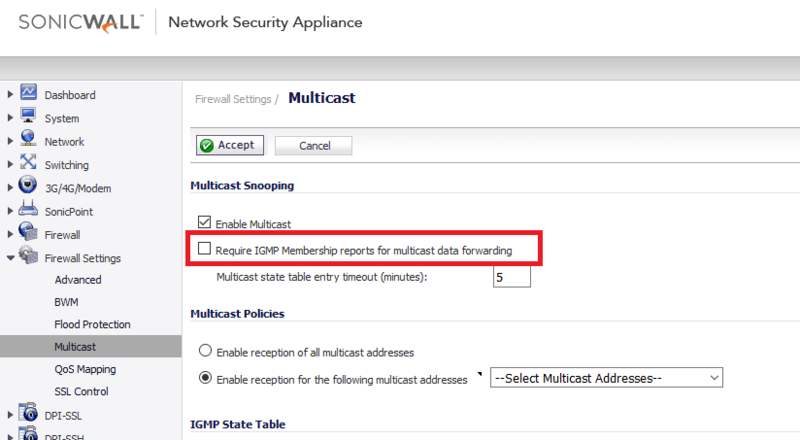 Change your Firewall rule not to NAT from any source to the multicast address. Symptoms: Discovery works and stops working in intervals. Solution: Check to see if you have some kind of Storm control enabled. Sometimes the configuration of storm control is too strict and starts to dissolve multicast traffic. Symptoms: Airtame devices don't show up in any platform. Solution: A misconfiguration in the Quality of Service can cause discovery packets to be dropped in favor of other types of traffic. Make sure Multicast traffic is not on low priority.